President's Message: In September 1988 Rodney Dillon, Robert Godwin, Dr. Joel Gordon, and Greg Parkinson met and discussed the Civil War. Within six months, the Civil War Round Table of the Palm Beaches was formed and it had twelve members. Over the past twenty-three years, the Round Table has grown into a productive, viable, and flourishing organization. As one member told me, "I learn a new fact about the War at every meeting that I attend." We have been fortunate to have a wide variety of speakers with diverse topics and opinions. 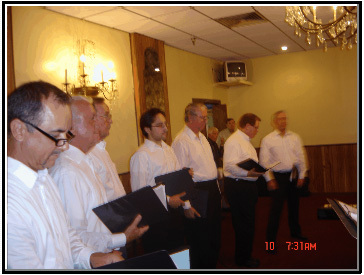 Past presenters have included: Tad Allen, Harold Holzer, Robert Macomber, and Craig Simons, as well as many from the Round Table membership roster. Whenever a member gives a program, we thoroughly appreciate all the time, effort, and research that it takes to prepare it. Sometimes there have been very heated discussions, but that is what the Round Table is all about. We are a nonpartisan study and discussion group and welcome varying points of view. Understanding the people and the stories behind the War makes the past seem more meaningful and vivid. Having a deep appreciation of history and knowing where we have been as a nation encourages us and stimulates our desire to further our knowledge about the Civil War. Our outstanding attendance at every meeting demonstrates this point. The Round Table has been here for Civil War enthusiasts. This year the Round Table requests your help. In order to continue inviting outstanding speakers for future programs donations are needed. Our dues are minimal and only cover the monthly rent for the meeting hall. Your financial support will be deeply appreciated. At the September meeting please give as generously as possible to the Speaker's Fund or mail a check to Stephen L. Seftenberg, at 2765 White Wing Lane, West Palm Beach, FL 33409. Justice David Davis (March 9, 1815 - June 28, 1888) will be interviewed by a member of the press. The discussion will range from his early life to being a Circuit Judge in Illinois, Lincoln's Campaign Manager, Associate Justice of the United States Supreme Court, Lincoln's Executor, US Senator, Presidential Candidate, President Pro Tempore, and finally, retirement. Ed Palmer led eight singers (Steve Hammaker and Greg Scherba, tenors, Nathaniel Adams and Erik Borgen-Larrsen, tenor IIs, Jack Hughes and Alan Lin, baritones, and Daniel Lowery and Ed Palmer, basses), accompanied by a talented pianist, Joanne Nelson, in rounds of Civil War songs, some sentimental and some rousing. They sang Aura Lee, Lorena, Home Sweet Home, Stars of the Summer Night, Gentle Annie, The Vacant Chair, Tenting on the Old Camp Ground, When Johnny Comes Marching Home Again, and Dixie. A wonderful musical evening ended with a rousing rendition of God Bless America, in which the entire group joined in (even your tone deaf editor). Ed provided short backgrounds on each song, which added to our enjoyment. All these songs (except, perhaps, God Bless America) were popular on both sides of the trenches. Compared with songs still sung, such as Home, Sweet Home, When Johnny Comes Marching Home Again, and Dixie, some of the songs this group sang so artfully are not well known today, so their lyrics can be found below. For "if we try we may forget,"
She sleeps my lady sleeps, She sleeps, sleeps. She sleeps; my lady sleeps, she sleeps, sleeps. She sleeps, my lady sleeps, she sleeps, sleeps. By the streams and the meadows were we strayed. Sweeping o'er our heartstrings now. The crowd gave Ed Palmer and his singers a big round of applause. Only then did he confess that this group had never had an opportunity to rehearse! If he had not said this, we would never have known! Music touched practically every aspect of soldiers’ lives. They were awakened in the morning with the first call of the bugle, riveted into step by drums and fifes, serenaded in camp by banjos, fiddles, harmonicas and jew’s harps and even put to sleep by a lone bugler. But although instrumental music was linked to almost every step the soldiers made, it was often the songs that mattered most. Sung by soldiers and by those who stayed behind, it was the songs that truly expressed the emotions, fired the patriotism and filled the emptiness felt by leaving loved ones at home and facing death at every turn. Perhaps the most popular Civil War songs were actually those songs that were old or well known before the war. Far from home and loved ones, it is not all that surprising that the all-time favorite song of both sides was “Home! Sweet Home!” Ironically, of the two men who composed it, one was homeless and the other was known as a “home-wrecker.” The lyrics ... were written by John Howard Payne for an opera that was first produced on May 8, 1823. He eventually served time in a debtor’s prison. The melody ... was composed by Sir Henry Rowley Bishop, a well known English conductor who has known as “a notable reprobate, home-wrecker and spendthrift.” He died in poverty. Certainly, one of the most popular Civil War songs that preceded the war was “Lorena.” It was written in 1857, long before the war tore soldiers from their wives and sweethearts. With little else to comfort them, “Lorena” reminded soldiers of the separation they endured through the war’s long years. The lyrics were written as a poem by Rev. Henry De Lafayette Webster and the melody by Joseph Philbrick Webster, who also wrote the music to “In the Sweet Bye and Bye.” Although “Lorena” was sung by soldiers on both sides, it was more widely sung by Southern soldiers. They didn’t seem to care that it was written by a Northerner and first published in Chicago. 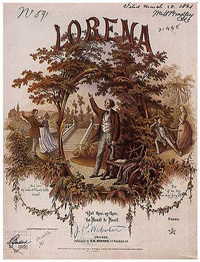 Many Southern soldiers who returned from the war went on to name their daughters “Lorena.” Some writers have even gone so far as to blame the loss of the war on “Lorena.” So many Southern soldiers grew homesick and deserted after singing it, that several Confederate Generals prohibited their soldiers from singing “Lorena,” but most soldiers disobeyed orders and sang it anyway. To satisfy the enormous demand for the lyrics of the most popular Civil War songs, printing presses on both sides of the conflict ran around the clock. In 1861 alone, an estimated 2,000 pieces of music were written and published in both the North and the South. By the war’s end, this figure had grown to some 10,000 songs. As the Northern blockade of Southern ports exerted a strangle hold on the South, the quality of printed music in the South sharply deteriorated. At the beginning of the war, Southern music was printed on heavy paper with dark black ink. By the war’s end, music was printed on paper so thin that it collapsed when leaned against a music stand, and the ink was so light that one had to strain to read it. Even Southern newspapers suffered from a lack of paper. They were forced to use paper made of straw, corn husks and cotton. In contrast, Northern presses enjoyed abundant quantities of needed printing materials, and the quality of their printed work remained high throughout the war. Although soldiers enjoyed instrumental music, by far the most common musical outlet was singing. Soldiers sang, whistled and hummed on marches, behind earthworks, while waiting for orders, in camp, and even on the eve of a battle, with their muskets primed and ready. They sang solo, in duets, trios, and they often formed glee clubs. Sometimes entire regiments, Generals and all, sang on marches. Some soldiers paid with their lives when their song tipped off their location to an enemy sharpshooter. Although music certainly fanned the flames of patriotic zeal, soldiers on both sides were occasionally reminded of their common heritage. On the eve of the final day of battle at Murfreesboro, on July 1, 1863, Union and Confederate bands took turns playing tunes for their men. Finally, when one band struck up “Home! Sweet Home” both bands, and most of the soldiers on both sides joined in. For many soldiers who had never traveled far from home, the Civil War changed their musical tastes forever. For the first time, many were exposed to instruments like the banjo, the harmonica, and the jew’s harp. By mixing with soldiers from other regions of the country, they learned new songs and became acquainted with musical styles they had never heard before. The memory of these new sounds lingered long after the din of battle had faded away.